The increasing frequency and severity of natural disasters in the ASEAN region requires the continuous strengthening of the ASEAN Emergency Response and Assessment Team (ASEAN-ERAT), to quickly respond to disasters and provide support to affected ASEAN Member States when required. The ASEAN-ERAT Transformation Plan 2015-2020 is now being implemented to address the challenge of the team’s continuous development. With plans to develop the ASEAN-ERAT pool across three levels, the ASEAN-ERAT Transformation Plan has henceforth identified the need to have a selection of specific ASEAN-ERAT trainers. 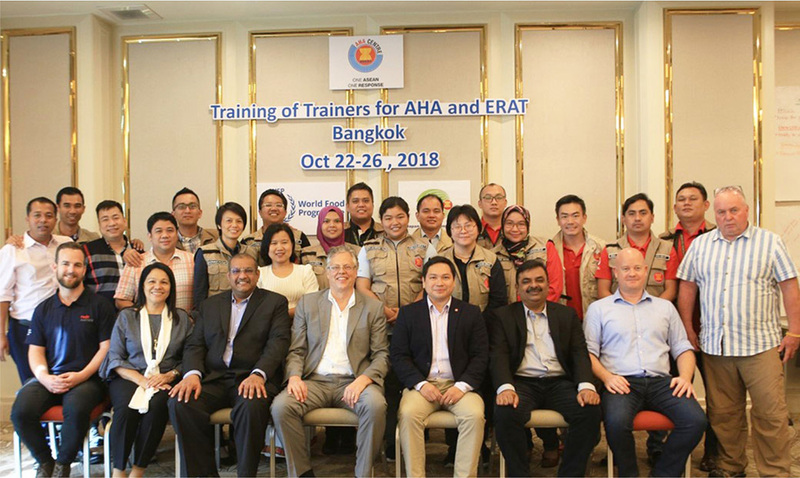 This pool of trainers adds to increase the strength of human resources for delivering the ASEAN-ERAT course, specifically meeting the objective within the Transformation Plan that presents a set of capacity building programmes to develop the three levels of ASEAN-ERAT. The main objective of ASEAN-ERAT Training of Trainers (ToT) is to develop the skills of selected ASEAN-ERAT to deliver aspects of the ASEAN-ERAT course, in particular their soft-skills related to their development as qualified trainers. The ToT training was conducted across a 5-day, classroom-based course, with 20 participants from 9 ASEAN Member States engaged to improve their capacity as trainers. The training was jointly conducted between the 22nd and 26th of October 2018 in Bangkok, delivered by members of the World Food Programme (WFP) Regional Office, with support from RedR Australia specialists. Such training of trainers is a key step in the development of this pool of skilled ASEAN-ERAT trainers, and designed to develop capacity and enhance the soft-skills of ASEAN-ERAT members who already possess strong technical skills across ASEAN-ERAT core functions. Participatory approaches and contemporary learning techniques were applied through the training to emphasise the importance of self-management with participants. Teaching practices and presentations developed amongst the participants are followed by group discussions to allow for feedback from both peers and facilitators, further working to enhance the togetherness and support that is cornerstone to the ASEAN-ERAT programme.